To this day, my face makes a slight frown whenever I watch the opening montage in X-Men (2000), which credits Stan Lee for creating the characters. In 1963, Lee did come up with a group of heroes called the X-Men, each born with the ability to skip the pesky mechanics of an origin story, but theirs was a tale of carefree adventure, not sci-fi angst. It wasn’t until Chris Claremont came along in 1975 that the mutant concept became an analogy for discrimination and the X-Men, tortured minorities who treat their gifts as a social burden. In short, the characters as depicted in the film were really introduced twelve years after their so-called creation. 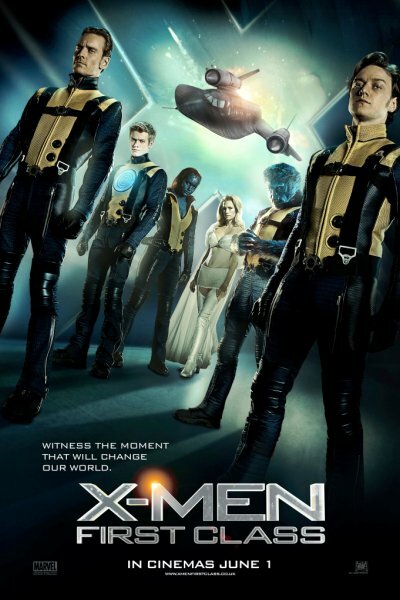 I mention all this because X-Men: First Class presents itself as a prequel to Bryan Singer’s movies. In terms of plot, that means it ties to events in the first X-Men but openly contradicts X-Men: The Last Stand (2006) and X-Men Origins: Wolverine (2009), which is just as well because I don’t like them, so there. In tone, however, the film bears a closer resemblance to Richard Donner’s Superman (1978), infusing modern pathos with the manic charm of Silver Age comics. Consider the emphasis on Cold War tensions and the magical properties of atomic energy. Set just before (and then during) the Cuban Missile Crisis in 1962, the main plot centers on the Hellfire Club, a mutant cabal conspiring to rid the world of humans by staging a nuclear conflict. How the James Bond villains expect their species to survive World War III is left unclear. Suffice it to say their grasp of evolution and radioactivity puts the “fiction” back in “science-fiction”. The wacky scheme links two independent stories, each worthy of its own motion picture. The most compelling tells of the burgeoning friendship between Charles Xavier (James McAvoy) and Erik Lehnsherr (Michael Fassbender) as they hunt down Sebastian Shaw (Kevin Bacon), leader of the Hellfire Club and bearer of mighty mutton chops. Events unfold much like in a sixties spy thriller, except the protagonists are destined to become mutantkind’s most important figures, so their every decision feels like history in the making. Much will be said of Fassbender’s intensity as the man who would become Magneto. The actor can hold his palms at digital effects like he means it! However, McAvoy left a bigger impression on me, portraying young Professor X as a spirited idealist whose pampered existence has blinded him to a simple truth: some have it better than others. In an inspired exchange, he excuses a human attack using the last words a holocaust survivor would want to hear. Whereas Erik knows firsthand what’s at stake for those deemed different, Charles views mutants as special and can’t imagine anyone thinking otherwise. This dichotomy fuels the movie’s second half, which focuses on the titular first class: Mystique (Jennifer Lawrence), the shape-shifting badass from the previous instalments; Beast (Nicholas Hoult), who hates his monkey feet; Angel (Zoë Kravitz), a stripper with bug wings and nitroglycerin spit; Banshee (Caleb Landry Jones), who couldn’t find a boy’s name to match his supersonic scream; Darwin (Edi Gathegi), whose physiognomy adapts to any threat; and Havok (Lucas Till), a brooding pretty boy who sparkles in the sun (just kidding). I like their recruitment montage, which harks back to Giant-Sized X-Men #1 and features a hilarious cameo I dare not spoil. Unfortunately, the kids aren’t given much breathing room as they’re rushed into training to face the Hellfire Club. “Look at all we’ve accomplished in a week!” one of them exclaims. “Uh, what?” asks the audience. Even Mystique, who gets as much screen time as Charles and Erik, merely functions as a springboard for their philosophical debate. It doesn’t help that Lawrence, a revelation in Winter’s Bone (2010), never finds the right note for the character, coming off stiff and, well, kind of annoying. Like the original movie, Fist Class could have used an extra hour or two to flesh out its ideas. Shaw, for example, appears as an elderly scientist in 1944 but seems about fifty in 1962. The special effects hint that nuclear energy rejuvenates him, providing an ulterior motive for his ploy, but the matter is never properly addressed. By the same token, Charles and Erik bond much too quickly, giving little explanation for their sudden camaraderie. Theirs is a bromance for the ages, sure, but I feel we’re missing the courtship. What the film lacks in rhythm, it makes up for in style. Director Matthew Vaughn really captures the dynamic appeal of the source material. Remember those yellow and blue jumpsuits that Singer thought too silly to put on the silver screen? They show up here, and they look great. That’s because Vaughn creates a believable universe for them, one where a serious super-villain can sport a cape and paint his helmet burgundy, not to flaunt his metrosexuality but to accentuate his awesomeness. 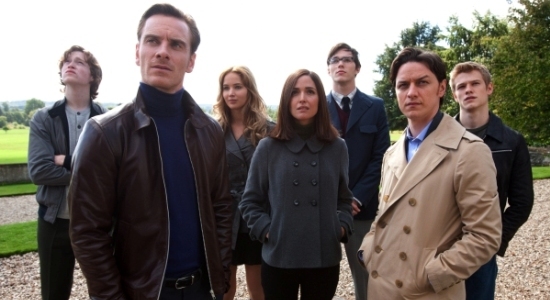 X-Men: First Class uses this Silver Age aesthetic to enhance its central metaphor with varying degrees of success. Consider the dated way the Hellfire Club objectifies its female members, how it echoes the challenges mutant liaison Moira MacTaggert (Rose Byrne) faces at the CIA. How much of this comprises commentary? How much is just titillation?